The ECS RA4 B5/B6 A4 Complete Clutch Kit is built around the well known and powerful OE RS4 clutch disc and pressure plate designed to handle the stock 380 daily driven horsepower of the European RS4. A direct bolt up to the stock 1.8T crank is made possible by the ECS Tuning custom designed lightweight steel flywheel. Increasing the disc diameter to 240mm over the stock diameter of just 228mm and reducing the combined rotational mass of the flywheel disc and pressure plate increases performance. 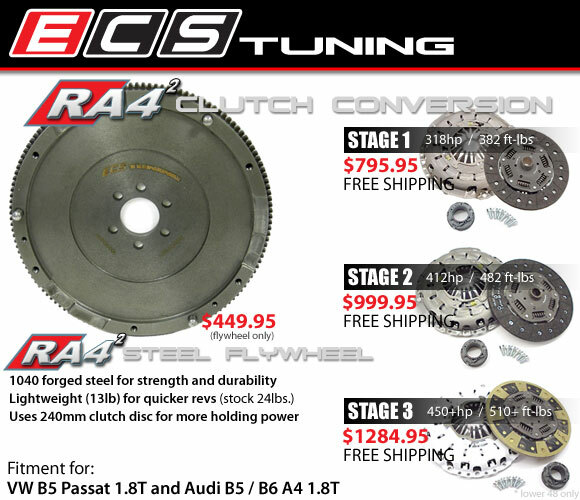 ECS Stage I RA4 clutch kit does NOT include a RS4 clutch, but rather an OE S4 clutch & pressure plate. ECS has put together this clutch kit for customers looking to upgrade their clutch kit to a unit that was designed to hold 100 more HP than their stock clutch & still retain almost stock like clutch feel. This kit will easily handle mild turbo upgrades & yet will not have the somewhat heavy pedal feel that the OE RS4 clutch kit delivers. You can find all details on ECS tuning.